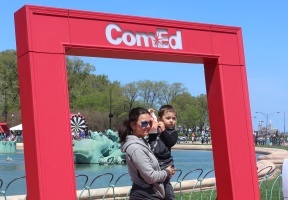 ComEd and the Chicago Park District kicked-off the much anticipated months of fun and warm weather that Summer brings by turning on Buckingham Foundation on Sunday, May 6th as part of ComEd’s fourth-annual “Switch on Summer” event. “We take our responsibilities to our customers seriously, both to connect them to safe and reliable energy and to invest in our vibrant communities,” said Anne Pramaggiore, president & CEO of ComEd. “We’re excited to bring residents, visitors, and Chicago’s favorite organizations together again to switch on the iconic Buckingham Fountain and welcome the warmer months ahead.” More than 20 organizations participated in the afternoon event, which included giveaways, family-friendly activities, and live entertainment. “Buckingham Fountain is a historic landmark that has served as an iconic symbol of Chicago’s rich cultural legacy for the past 91 years,” said Chicago Park District CEO & Superintendent Michael P. Kelly. 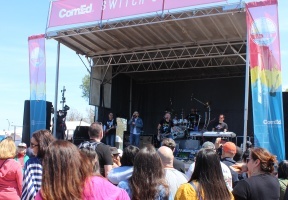 “We are excited to partner with ComEd for the fourth year to switch on the fountain and officially kick off the season of outdoor activities and fun in Chicago.” WGN-TV Chief Meteorologist Tom Skilling served as master of ceremonies for Switch on Summer. Misha Brown, a ComEd customer from Chicago’s Fernwood neighborhood, switched on the fountain in front of thousands of attendees. Brown was selected via a Facebook contest that asked entrants to label this accurate statement as true or false: There’s plenty of sunlight to power solar energy in Illinois. For event updates, please visit ComEd.com/SwitchOnSummer.